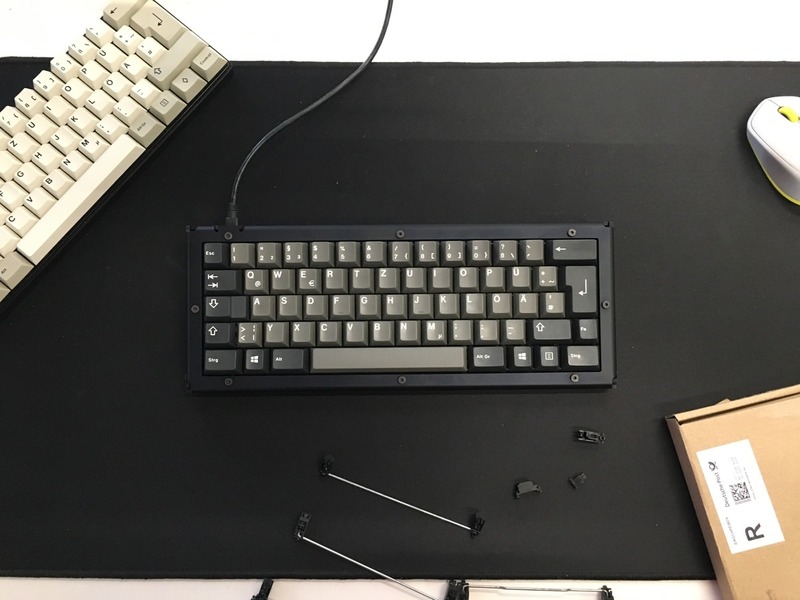 Another question regarding PCB, the KBDFans will be available with USB-C soon(ish), does the case work with that as well? Oh you're right, this one, hadn't noticed it jet. Shouldn't be a problem. The connector is at the same place. Although USB-C is a smaller connector than Mini-USB, sometimes the part behind the actual connector - that where you hold it (sorry, don't know how to describe it else) sometimes looks huge on USB-C cables. So just make sure your USB-C cable doesn't have a "bulky head". Other differences compared to the previous version of the 75% PCB seem to be the holes for the standoffs - but we don't have to care about this at all, since this would only be a concern for tray mount cases. So short: the PCB will fit perfectly fine. ...yes, now with split spacebar support. I'll update the plate to support it as well. do you know when you'll receive the samples or are there any updates on this one? Still don't have the samples. I'll ask again today, so hopefully I'll know soon. Sorry, it is terrible for me as well, that this is dragging on for so long now. I'll get the samples in mid march. so roughly two more weeks waiting. OK, I was informed that I can pick up the samples next Tuesday or Wednesday. Finally got the samples on Wednesday! Big relief, everything is fine and fits. The plan was to only show you the samples after I finished a nice build and took superduper DSLR pictures. But now I feel like I don't wanna let you wait any longer and it might take at least another week until I have DSLR pics. Also someone told me he thinks that quick n dirty mobile pics are more honest and trustworthy. At least I finished the build today. Though there is one changes I want for GB production. The bead blasting is too fine, I want it to be much rougher. Good thing I made the samples. Looks awesome, might have to go in on a 75%. This is exactly what I have in mind for mine, with the exception of going for the 70%. Edit: O, and I have forgotten the core of my post: This looks GREAT! Looking very good! Good call on rougher sandblasting! Looking forward to this! Looks so good, can't wait for the GB and can't decide if standard 60% or WKL...but anyway great job on the Proto it looks great! Would be interested to get an idea of weight on your finished build and also maybe get a typing test to hear how it sounds. Yesterday I made a second build from the samples I got. This time the HHKB version. Wanted this to be a perfect build so it took quite some time, here is the IMGUR album. Good work, I really like these screwheads compared to the ones in the last build. I like both screw types. letting people choose which they want would be a logistic nightmare for me. so I consider just giving everyone a set of both types. then you can decide when you get them. Although i missed the IC forms etc i am really liking the looks of the case and trying to be something different that isn't just lets mill this block of aluminium into a shape. I already have a project to do over the summer but i might pick this up for later. PlastikSchnittstelle wrote: ↑ I like both screw types. letting people choose which they want would be a logistic nightmare for me. so I consider just giving everyone a set of both types. then you can decide when you get them. PlastikSchnittstelle wrote: ↑ Yesterday I made a second build from the samples I got. This time the HHKB version. Wanted this to be a perfect build so it took quite some time, here is the IMGUR album. Wodan always makes things look so easy and fun in his sub 60 or sub 90 minutes live streams. When I was having hours and hours or even days of frustrations, doing the same or very similar tasks. By the way, what lube did you use and where did you get them from? Looks great man. Btw, did you do a 75% sample? RealLaugh wrote: ↑ Looks so good, can't wait for the GB and can't decide if standard 60% or WKL...but anyway great job on the Proto it looks great! Would be interested to get an idea of weight on your finished build and also maybe get a typing test to hear how it sounds. yes, a typing test, sure, that would be great. I just don't have the right equipment to do that. would an iphone 6s be ok? don't mobile phones have automatic noise cancellation? if so it would not produce an accurate representation of the sound, right? not sure how to takle this without spending a lot of money. DarKou wrote: ↑ Looks really great. no, sorry, they won't work. we settled on the screw type some time ago. kokokoy wrote: ↑ Looks great man. Btw, did you do a 75% sample? as much as i would have liked to, this would have been too expansive. It is basically the same price if i do just one case or five. setting up the machines is what costs so much. adding different parts would require a different machine setup again. more of the same part instead doesn't require any new setup. Menuhin wrote: ↑ By the way, what lube did you use and where did you get them from? for the stabs i used OKS 1110 Silikonfett. for the switches, after researching for a long time, I decided to use Reely Silikon-Stoßdämpfer-Öl. you can get it in in many different levels of viscosity - i went for 800. I used it already for the 65% prototype build which has gateron black switches. I use the prototype board since last summer and I think the result was and still is perfect. this method saved me a lot of time. Recipe straight from the locals, I appreciate it!